The rescue ladder is four meters in length to ensure it reaches the water from e.g. high quays. 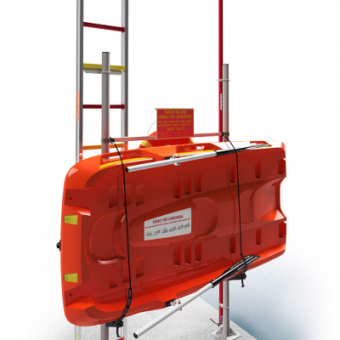 It’s equipped with hitch hooks and spacer pads and is type approved by the Swedish state test facility as rescue ladder according to the regulations of the Swedish work environment authority and the EU (AFS 2004:3, EN 131). The all-aluminium rescue ladder is a custom designed, multifunctional tool for life saving. It’s easy to carry and to hang on e.g. a quay so the distressed person can climb up. It can also be used as a lift- and pull device if the distressed person is too weak to climb the ladder themselves. By placing the hitch hooks under the arms of the distressed person, the ladder will act as a crane. The ladder can also be used as a stretcher as well as a flotation device, in absence of a life buoy, because of its floating properties. Read more under the tab Features. 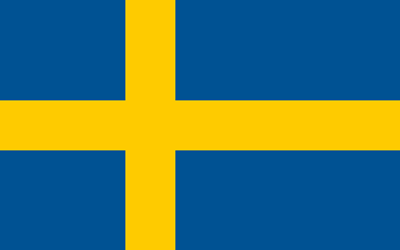 Shore Safetys lifesaving equipment meet the requirements of the Swedish Civil Protection and Emergency Agency (MSB). Robust construction in all-aluminium that copes with tough situations. Place the ladder with the hitch hooks on the quayside and let the distressed person climb up. The spacer pads that hold the ladder from the quay makes it easier to climb the ladder. Make a ”quay lift” by turning the ladder ”upside down”, lower it into the water, place the hitch hooks under the arms of the distressed person and pull the ladder with the distressed person up and over the quayside. Finding the rescue ladder is an easy task thanks to its red and yellow rungs, the SOS-yellow reflectors and the “Rescue Ladder” signs. 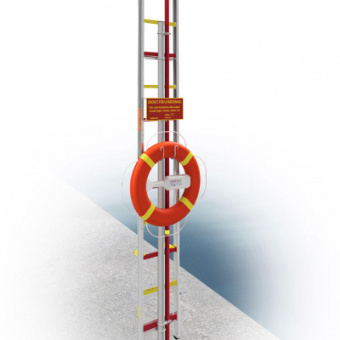 The ladder can also be used as a flotation device, in absence of a life buoy, because of its floating properties.